Boxcar, the excellent Twitter/Facebook/Email push notification iPhone app, has just been updated to version 2.3, which along with the usual routine bug fixes and code optimizations, also introduces a few new features. Though none of these new features are breathtaking, they do add to the overall usability of the app, and sometimes it’s just the little things that matter. Added support for instant push notifications of Twitter direct messages. Previously, only the mentions stream was instantly pushed, direct messages were checked on a schedule and pushed at frequent intervals, adding a short delay. This is now history, with Boxcar pushing DM alerts as quickly or quicker than my desktop Twitter app gets them. Added support for three new iPhone Twitter apps, including Twizzle, TweetTime, and LaTwit. Boxcar by itself is not a full-featured Twitter app. Instead, it simply provides the push notifications, and integrates with another full Twitter app. When viewing a Boxcar alert, it can open the Twitter app of choice, making it feel like your Twitter app actually has push notifications. Added support for caching of the notifications inbox. Previously, whenever Boxcar was launched, it had to communicate with the Boxcar servers and reload the notification inbox (this provides notification history, since the iPhone does not provide a native way to view old alerts). Now, Boxcar caches the inbox view, so only new changes have to be loaded when the app is launched, making it much, much faster to display the notification inbox. Removed the Christmas sounds. I actually never used any of the Christmas-themed alert sounds, so this doesn’t matter to me. But if anyone was still using a Christmas alert, thank goodness they’re gone now!! It’s almost February folks (and yes, I just recently heard an iPhone with a Christmas song as its ringtone)! Current owners of Boxcar can get the 2.3 update for free just by checking for updates in iTunes or on their iPhone. 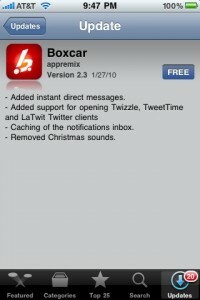 If you’re not using Boxcar, and you are a frequent user of Twitter and/or Facebook, you should seriously check it out. Push notifications really make a difference in the real-time experience of the social networking. Boxcar can be found in the App Store here and costs $1.99.